Those that know me well, know that I love my coffee. Morning latte’s, coffee flavored ice cream, even chocolate covered espresso beans. If it’s coffee flavored I’ll give it a try. But through trying so many coffee flavored goodies, one definitely finds their favorites. There is no denying, I’m a HUGE fan of Starbucks. Their coffee is my weakness. When one of their stores closed near my house, I had to figure out a way to enjoy my favorite coffeehouse drinks at home. Thankfully with a bag of my favorite coffee beans and a $5 espresso machine thrift find, I went on the quest to recreate my favorite flavors from a coffeehouse. 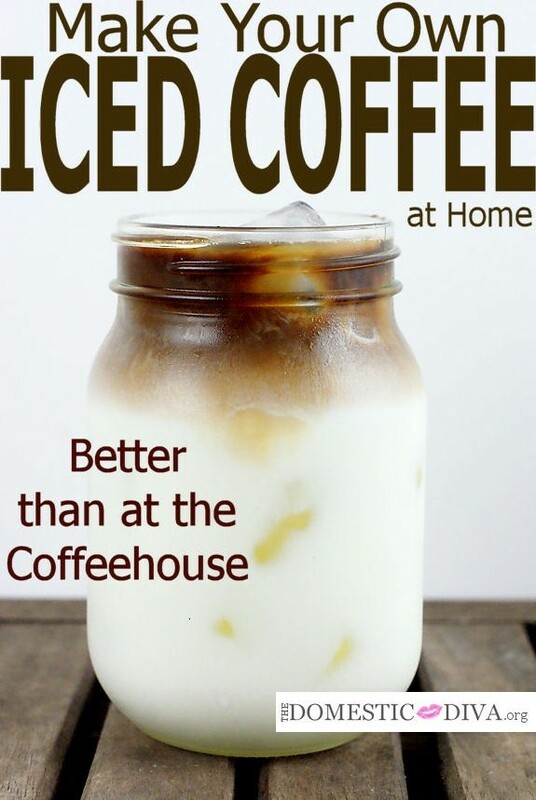 And below I’m sharing one of them with you today: how to make “better than at the coffeehouse” Iced Coffee. Fill a glass mug with ice. Layer ingredients in mug by pouring milk, simple syrup, and espresso. Serve with a straw. Before enjoying stir everything together with straw until well blended. Can be doubled to make more than 1 cup. 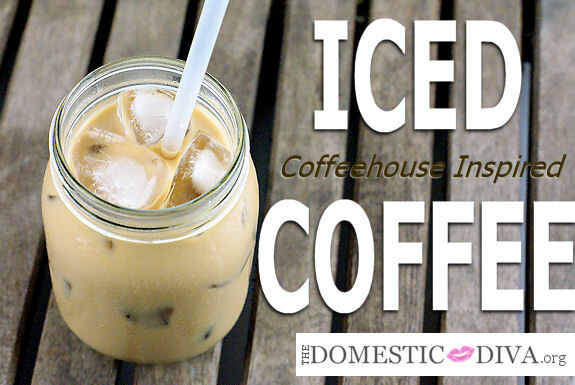 Making Iced Coffee at home isn’t hard to do but there a few things you’ll need. First, invest in an espresso maker. I was lucky enough to score a great thrift store find on one for about $5. Besides thrift stores, one can also look at yard sales for a cheap, used espresso maker. If you are in the market for a new one, Walmart has one that I also own and used for many years. The perk to buying a new Espresso Maker is that it will come with instructions for those just starting out making espresso on how to operate the machine, plus other helpful tips. 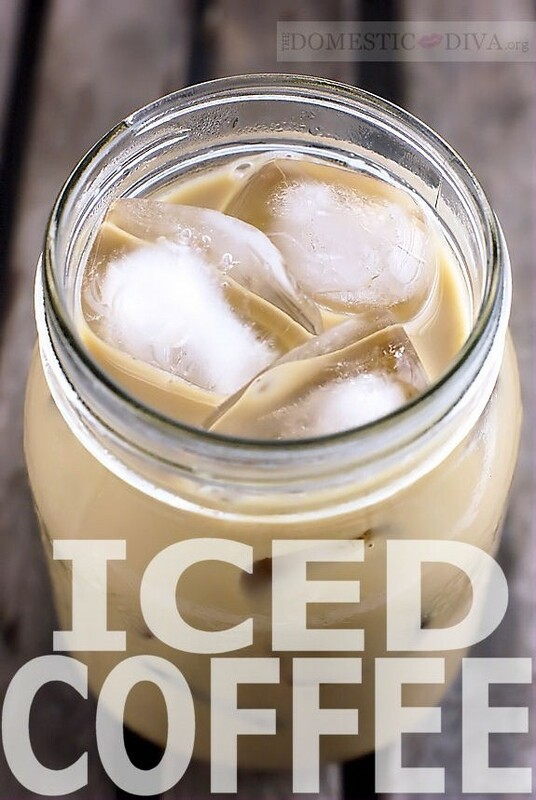 To make a good Iced Coffee there is some advanced prepping that needs to happen before you can enjoy your first cup. First, prepare your simple syrup which is equal parts water and sugar. I make my simple syrup in 1 cup batches (1 cup boiling water + 1 cup sugar) and store it in a squeeze bottle in the fridge. Secondly, one needs to chill espresso. When making espresso it is best to go with a DARK roast. I prefer to use Starbucks Dark Espresso Roast, just because it is my personal favorite but Cafe Bustelo is also a good espresso roast. Since espresso is very strong, a little goes a long way. So when I make my latte in the morning, I pour the leftover, unused espresso into a glass jar and store it in the fridge to make Iced Coffee with later. Iced Coffee starts out strong then mellows out as the ice begins to melt. Whole milk is I what I prefer when making Iced Coffee or my morning latte’. When everything is already prepared and chilled it’s easy to grab all of your ingredients out of the fridge to mix up an Iced Coffee to enjoy on a hot, summer day. What are some of the ways that you like to enjoy coffee?